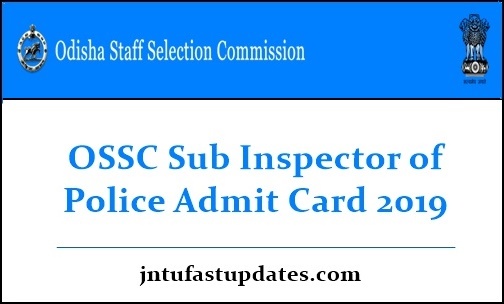 OSSC SI Admit Card 2019: Odisha Staff Selection Commission (OSSC) is going to conduct the Sub Inspector of Police written test shortly. The examination will be conducted in various examination centers across the state of Odisha. Thousands of aspirants wishing to get police jobs in Odisha are going to compete for the written test round in Odisha. All the aspirants who are competing for OSSC SI written test must get ready to attend the examination by downloading the admit cards. OSSC will make accessible of the SI admit cards on its website, ossc.gov.in. Just by tapping on the hall ticket download link, aspirants will be able to download the admit card. Admit card/hall ticket is the most important document required to carry to the examination. The examination officers will allow the aspirants to proceed with the examination only after verifying their admit cards. Hence all the hopefuls who are going to appear for the OSSC SI examination must carry the admit cards without fail. Odisha Staff Selection Commission (OSSC) works for various state government operations. The organization releases various recruitment notifications every year to hire eligible candidates into various government jobs. Candidates seeking to get Odisha state government jobs can keep checking the OSSC website on a frequent basis for latest job notifications. Recently OSSC notified 283 sub-inspector of police posts. A large number of candidates seeking to get police jobs in Odisha state have applied for OSSC SI posts within the scheduled application dates. The selection of aspirants will be done through written test, physical eligibility test, physical measurements test, interview, and document verification rounds. Candidates have to qualify in all the rounds to get shortlisted for OSSC SI posts. Aspirants have to download Odisha SI hall tickets from the official website, ossc.gov.in. The hall ticket/admit card will be available to download before 10 days of the examination. Aspirants can download the hall ticket and carry it while going to the examination. The examination officers will not allow the aspirants to the examination if they forget to carry it. Hence the hopefuls must carry their admit cards without fail while going to the examination.